But I have now officially been a tenant of “Honest Ed” for 4 months. For those of you who have never been to Toronto – the name “Honest Ed” may not be familiar – but to Torontonians his giant bargain store on the corner of Bathurst and Bloor is a landmark. When people come to visit me in Toronto – I always take them there as part of the “alternative Toronto tour”. Not only is it just about the cheesiest store in existence (with slogans like “Welcome, don’t faint at our low prices, there’s no place to lie down”) it is huge and filled with bizarre and kitschy wonders like 3D pictures of the Last Supper. 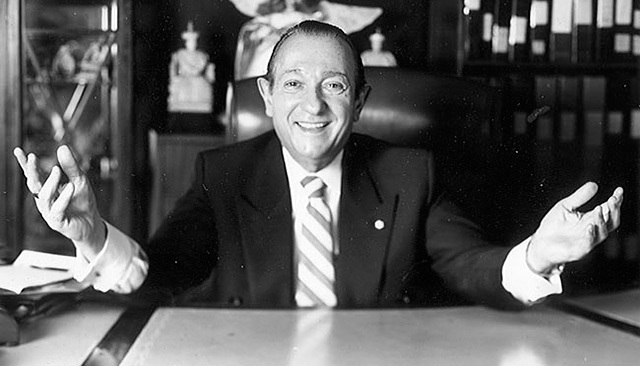 Ed Mirvish opened the store in 1948 – he claims it was the first bargain store in the world. It’s hard to describe Honest Ed’s to someone who’s never been there. The store is crammed with everything you can imagine from hardware to housewares to food, clothing and even a pharmacy and immigration services. The walls are packed with pictures of the stars (from Dean Martin and Elvis to Celine Dion) signed with a special note to Ed. Since he closed his famous restaurants he has moved the antiques that used to fill them to his store as well – so occasionally you run across a giant Buddha or beautifully carved Thai thrones. When he was alive (he just passed away at the age of 93 in 2007) he used to have special promotions on Saturdays where he would sell fresh whole chickens for 25 cents, or watches for 10 cents. Ever Christmas he gave away hundreds of turkeys. But the important thing for me about Ed was that he was a fantastic corporate citizen. Though everything he touched seemed to turn to gold – he also gave back to the community. After all this you will be surprised to learn that he saved several old Theatres – not just in Toronto – but also the Old Vic in London, England. Under his management, The Old Vic won more awards for its productions than any other single theatre in Britain. His investment in Toronto theatres changed the shape of Toronto, and made theatre respectable again. My studio is in “Mirvish Village” an area next to Honest Ed’s (the store) above an architect’s bookstore and across from a great Cajun food restaurant. 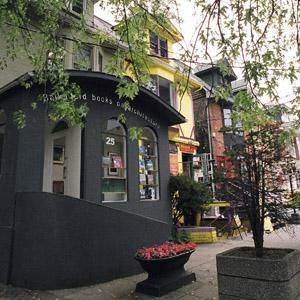 The street is lined with bookstores, art galleries, music venues, and is a legacy to Ed’s patronage of the arts. This legacy is still in real support, too – since the rental of this prime studio space in downtown Toronto is $252 a month! I am enjoying having a window that lets in actual sunlight, and working in a vibrant and supportive neihbourhood. This entry was posted on August 21, 2008 by imagocorvi in studio and tagged art, creativity, enamel, fine craft, Honest Ed, studio, work.